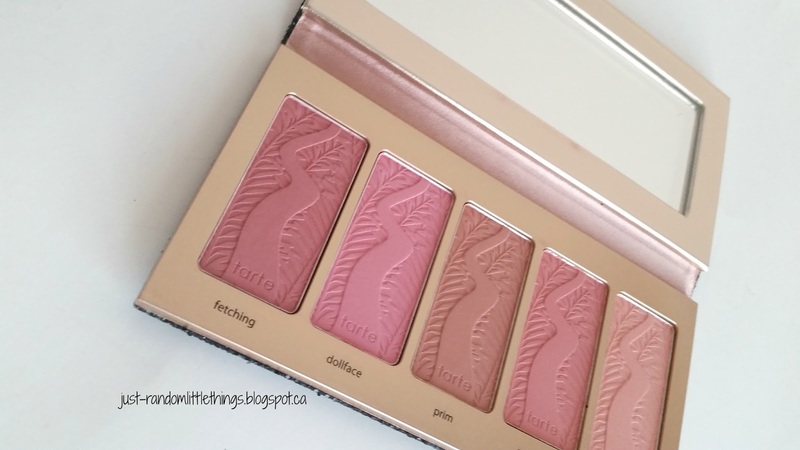 I'm a huge fan of Tarte Cosmetics and their products. 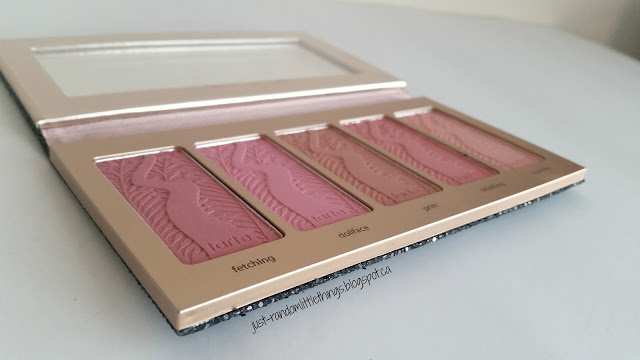 I had my eye on last year's edition of their holiday blush palette and when I finally decided to get it, I was too late... they were gone for the season! Naturally, when the palette was released this year, I had to get it! 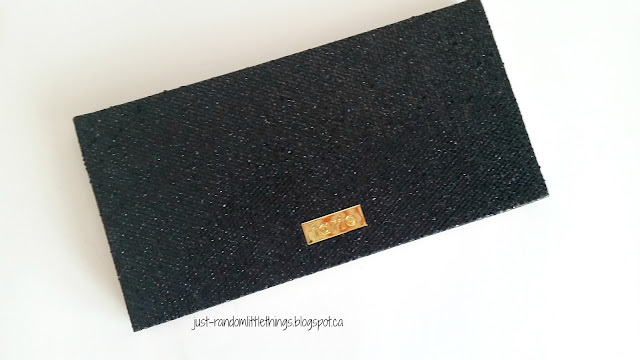 I thought I would share my thoughts on the palette as the holidays are rolling around and gift shopping has begun. I'm not an expert at reviews (in fact, it's my first...), but I hope I can give you good insight of the product itself. So here we go! I love how the packaging looks! It's very 'bling' and 'posh' for makeup packaging. What I don't like about it, is the surface is not smooth and the black glitter does flake off. It's not a huge deal but something to be aware of if you do purchase. The choice of blush colours couldn't be more perfect! It's the right combination of pinks, a mauve and peach colour - all the colours I use and would want in one blush palette. I like that there are three different shades of pink to choose from. Depending on what lip colour I am wearing, I have a variety of blush colours to choose from. The formula is spot on - as is any Tarte product. I apply a generous amount of blush in the morning and it sets evenly on my foundation. The colour is visible but not so much that it's overbearing. It's also blends very easily as well. I wear my makeup for at least 12 hours a day but I wouldn't say that the blush is long lasting, as at the end of the day my blush has faded greatly. However, for shorter time frames, this blush does the trick. With taxes, it cost me $59.89 at Sephora. Considering that one blush is $34.00 and that there are five blushes in the palette at a generous size, the cost isn't terrible. This would definitely not be a regularly purchased item for me. This was definitely a splurge and a product that I plan on using for a very long time. 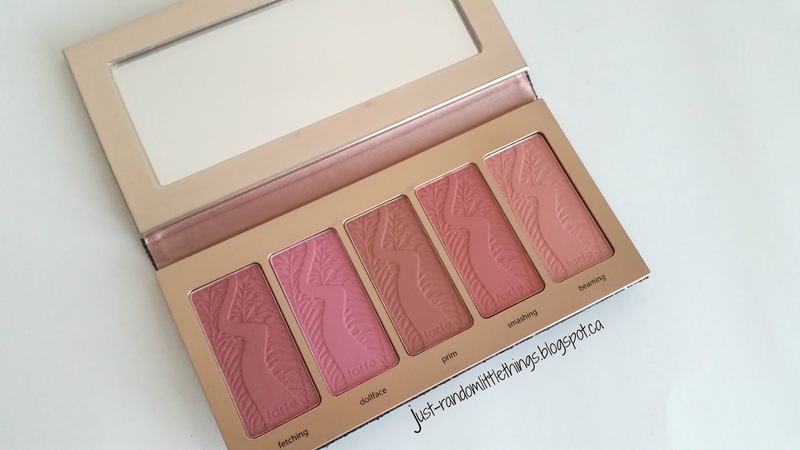 Overall, I love this blush palette! I honestly feel that I have all the blush I need to complete various makeup looks. It's a great makeup product that will give you a lot of use, wear and creativity! What's your favourite blush palette?